The best part of my day today was buying new shoes. Okay, that’s completely not true, except it kind of is. I only brought one pair of shoes on this trip, as I typically do when I travel. I don’t like packing multiple pairs. They weigh down the luggage and they take up valuable space for a four‐week trip that’s carry‐on‐only. 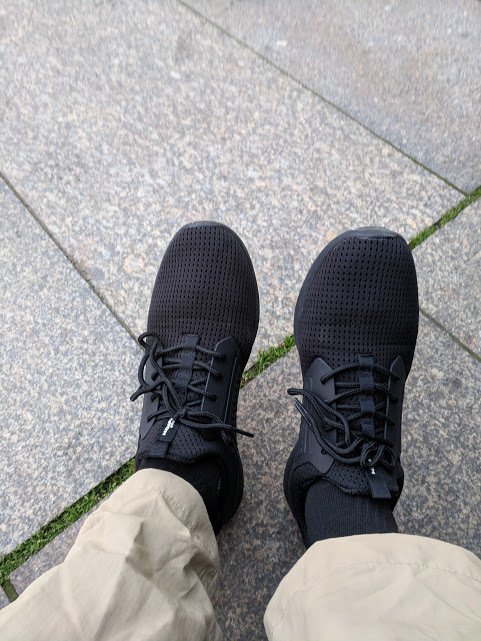 The shoes I wore for this trip are the same shoes I wore for my month‐long South America trip in November 2017. They are (or I should now say, were) Timberland shoes that worked well for city walking and also for hiking. They were very comfortable and versatile on that trip, so I was sure they’d work great for this one. I’m not sure when I realized they were rubbing against the top of my left foot, but it was sometime around day two or three in Prague. I tried band‐aids, but they were no help. Something like this can completely destroy the ability to enjoy a trip or can even force cancellation of plans. Another thing I discovered after a couple of days is that after walking around in these Timberland shoes all day, my feet wreaked something awful! I have never had smelly feet (at least not that I noticed), but this was astonishing! If I had taken off my socks and hung them in the window to air out, the entire city of Prague would have complained about the stench. Finally this afternoon I decided enough was enough, and I made my way to a nearby shopping mall. There, at a store called Deichmann, I found a new pair of shoes that are comfortable, lightweight, breathable, and don’t rub on the sore spot when I walk. Plus they look acceptable for tomorrow night when I’m going to the Semperoper. Plus it’s fun to shop in a shopping mall in a country where nothing is familiar. This was the Payless‐style shoe store, where all the shoes are out on the racks and you find your size and try them on. I had to look up the size conversion (I’m a 45), and I tried on a lot of pairs that didn’t fit at all or were very tight. Finally I found these. The brand is Memphis One, which I guess you can get in the US at Amazon or Walmart. Of course, I was wearing them home, so I stuck my old shoes in the box and went to pay. So I opened the box to show her I had put my old shoes in the box. She said she needed the new shoes (because it seems they have some sort of chip in them to prevent theft). So I took them off and she rubbed them on the counter and then she let me put them back on. The she asked if I wanted the box. And I said, I don’t even want the old shoes. She didn’t take them, but she pointed out a trash bin in the mall. And the Timberlands will soon find their way into a German landfill. I had a good tourist day too. I’ll save that for another post. People are asking Brooke how she got to Germany?? Nice shoes! Were they expensive? They were only 25 euros.